Why is the Ford Escape regarded as a popular crossover? Take a closer look at these technology features to discover why. 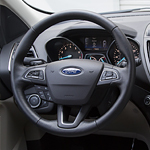 The new Ford Escape comes with the Blind Spot Information System, making driving on the highway much safer for all. If another vehicle begins to move into either of the blind spots around your vehicle, an alert will flash on that corresponding side mirror so you can slow or take the appropriate action to avoid an accident. Another impressive feature in the new Ford Escape is the Lane-Keeping System. Regardless if you are tired or distracted, when the vehicle starts to drift over the lane lines, the vehicle will try to correct. The vehicle's steering wheel will begin to vibrate to alert the drive they need to start taking action before the car leaves the lane. Visit Sheehy Ford of Gaithersburg today so you can take the all-new Ford Escape out for a test drive.